Here is a wonderful book for you, Esteemed Reader. If you haven’t read it, you should. I guarantee you’re going to have a laugh or two and what’s more, you’re going to be thoroughly engaged in a work of science fiction unlike any other you’ve ever read. A teacher read this book to my class many years ago. It was a hit with me then and it’s a hit for me now that I’m grown up and reading it again. In the interest of full disclosure, I didn’t actually read this book. I listened to it as read to me by Madeleine L’Engle on audio book, usually while doing the dishes or working out. If you’re an audio book enthusiast like I am, I highly recommend listening to this book as there’s just something really special about hearing an author read her own work to you. There is always an intimacy between reader and writer (sometimes an unwelcome one), and hearing Madeleine L’Engle speak her written word the way she meant to say it increases that intimacy. For those who say some authors (not L’Engle) aren’t good readers, I say posh. Even if the writer stutters through it, or worse, cries during the sad parts of their own novel they presumably knew were coming up when they started reading it, I’m still fascinated by hearing their vocalization. 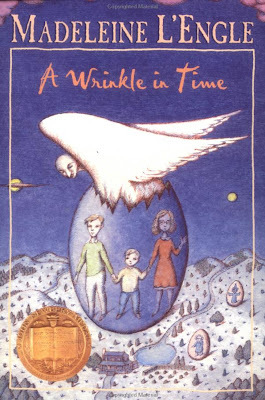 But enough with my love of audio books and authors, let us move on to my love of A Wrinkle in Time. The plot is tricky to explain, but I’ll give it a go: Meg Murry and her little brother, Charles Wallace, are extremely brilliant, gifted children who have been selected by alien beings, one of whom is actually a star (long story), to save their father from a planet that has been overrun by an evil black cloud. Not much is ever said about what the cloud is or what its motive is, but it’s really bad (sort of like that smoke monster on Lost). Is everybody still with me? No? Well, if not, you’re just going to have read this book and you should. It makes sense the way L’Engle wrote it, but she had a whole book and I’m not sure how to summarize it in a few sentences. But the one line pitch is thus: to save their imprisoned father, Meg and Charles Wallace must travel to another planet and do battle with an evil alien force. Meg and Charles Wallace and their friend Calvin arrive on Camezots, the planet threatened by the cloud thingy, to find that all of the inhabitants have fallen under the influence of a single brain. Mr. Spock, this planet is exactly like earth but with a twist! The people of Camezots are calm and sedate. They have given up their free will in favor of allowing the brain (literally just a big brain like Krang from T.M.N.T.) to do all their decision making for them. Their society functions perfectly. There is no crime, no poverty, no racism, no rich bankers blowing through money and then asking citizens for more, no insurance companies denying care to children to up their earnings—you get the idea. What could possibly be wrong with life in such a place? Answer that, and you will have deduced L’Engle’s major theme. The events on Camazots are the real story in A Wrinkle in Time, which is why L’Engle breezes through the technical details of space travel and gets right to the heart of things. Middle Grade Science Fiction writers should take note of this. There are no lengthy descriptions of equipment, or obligatory space cadet training summaries, both of which would be fine if they were the focus of the story, but they would have been intrusive here. Although L’Engle encourages her readers to study science and mathematics throughout the book, there’s very little science in it. The children travel to another planet by way of three women who are not human and who are basically magic people. The children may as well have ridden to Camazots in a great glass elevator or been flown by Superman. Because the characters are believable and react to their situation believably, suspension of disbelief is achieved without need of a lot of dry details. Who cares how the children got there, the point is they are there. The last thing I’ll say is that L’Engle’s master stroke is focusing her tale on the metaphorical journey of the characters, specifically Meg, rather than the interesting, but ultimately less relatable minutia of space travel. This is what makes her story universal and I’ll wager it’s the reason this book is still on the shelves of booksellers forty-eight years after its first publication in 1962. I think all of the things you said are true. Mostly because I read the things you had to say and when I was done I went about my day. It was a wonderfull day that beemed only happy things from only happy places. I loved a wrinkle in time when I was a child, but can only remember something about Katchup getting people high. Sweet crimson Katchup, can you fail at nothing? Where do I pick up my free gift for this.